Most common in the region of Radomir in the second half of the 19th and the early 20th century were the making of boza (millet-ale) and the tailoring or saya-making (saya, a type of long, female dress). These crafts involved travelling. 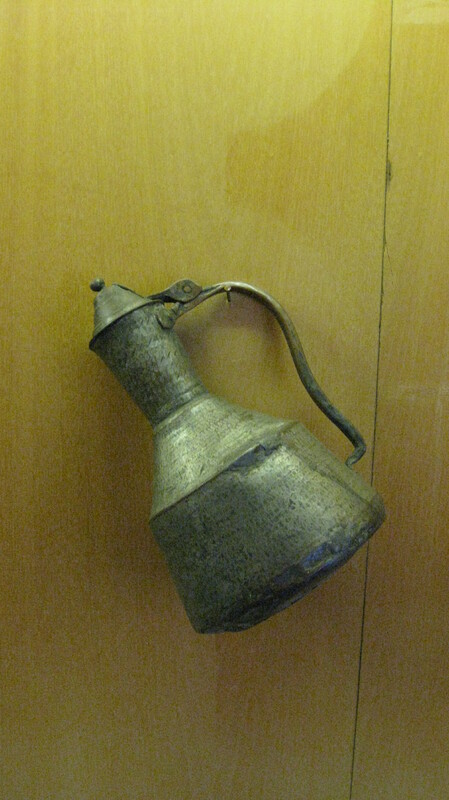 The boza-makers used to practice their trade all over Bulgaria. In the autumn, right after the end of the field work they used to travel with their inventory to the different towns in the country and work there and returned to their native towns and villages not earlier than for the next spring sowing. Along with the boza they produced different types of khalva – from sunflower seed, sesame seed, black khalva, fruit khalva, etc. From the mid 20th century on, the pastry-shops replaced the manual production of boza. In the village of Dolni Rakovets a modern installation was built by ET “Elektra” Radomir for the production of Radomir boza following the traditional technology. BOZA is a popular fermented beverage in Bulgaria. 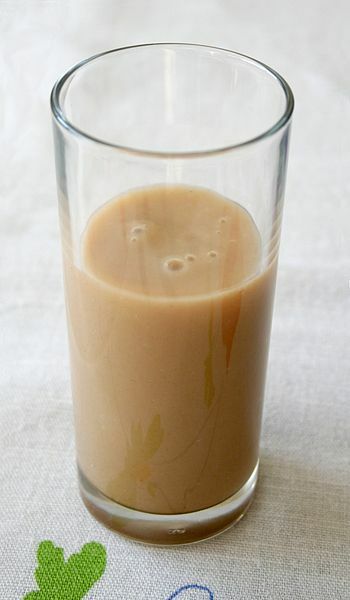 It is a malt drink, made from wheat or millet . It has a thick consistency and a low alcohol content (usually around 1%), and has a slightly acidic sweet flavor. Here follow the instructions for making boza at home. The recipe is meant for 5 liters. 5 l water,2 teacupfuls flour,2 teacupfuls sugar,1 teacupful boza or home-made ferment. Slightly roast the flour (to become rosy in colour). Take care not to get it burnt. Mix it with only a bit of lukewarm water. Pour the mixture into the pot filled with the rest of the water and put it on the plate. Add the sugar and leave the liquid to boil stirring it once in a while. Keep boiling for 5-6 minutes still stirring. Remove the pot from the fire and let it cool. Add 1 teacupful boza or home-made ferment. Leave the mixture in a warm place for 2-3 days to cause fermentation. When the boza is ready, pour it in bottles and store in a cool place (refrigerator). Mix the slightly roasted flour (take care to keep it from burning) with the water and stir well. Add the sugar. Leave the mess in a warm place for 2-3 days to ferment, stirring it from time to time. Note: The teacupful of boza or home-made ferment can be replaced by 6-7 moistened and crumbled slices of wholemeal bread /or toast/, or by 6-7 spoonfuls leaven. In this case before storage the boza has to be filtered (without pressing). 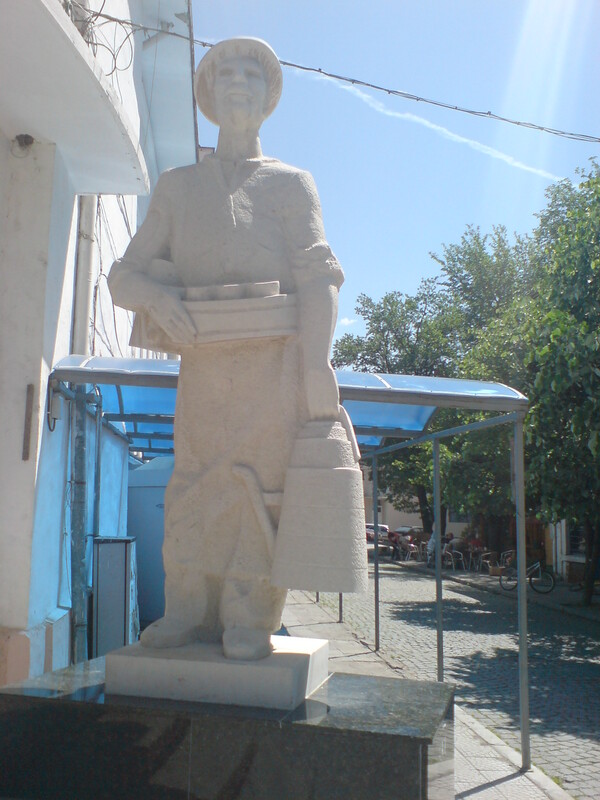 As we are very proud with boza-making in our town, we have a monument devoted to boza-makers. We call them Bozadzhii. Dear schoolmates. I would like to congratulate you for the wonderful website you’ve created about our town’s culture and ethnography. 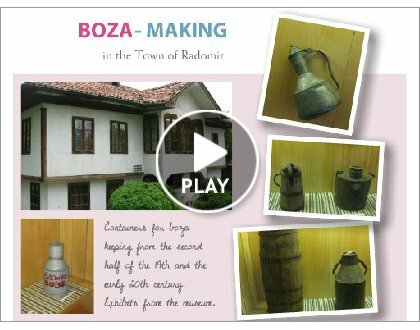 We are very proud of boza-making here and now your partners can try to make boza at their homes. Boza is famous in Türkiye too. A kind of grain water(Wheat-barley…). A salesman with a big tankard on his back and shout; BOOOOOOZAAAAAAAAAA!! !